Australia is such a huge country that the beginning of air travel represented a very important step in the development of the country and communication among its citizens. Before air travel, it took days to move from one city to another. 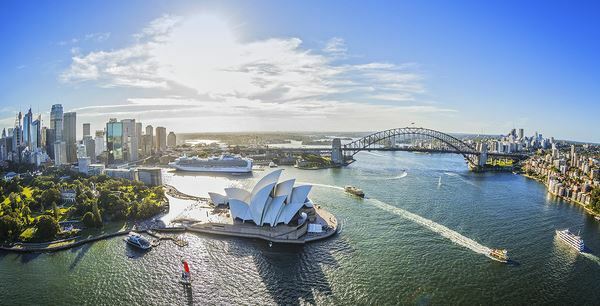 Now, to go from Sydney to Brisbane or Melbourne, it takes only one hour on a low-cost airline. Whether you are a foreigner living or working in Australia, or a backpacker traveler coming to visit the country for the first time, you are probably interested in knowing how flights work in Australia. Australia has some of the cheapest airlines in the world. Considering that there are more than 3,000km from one part of the country to another, the cost per kilometer is very reasonable. This is thanks to the introduction of low cost airlines such as Virgin, Jetstar or Tiger, which you can use to easily travel among the country –and without spending much money. The airports of Australia are modern and very busy. Sydney Airport is incredibly close to the city center and when you are on the landing runaway you can easily see the skyscrapers of the city center. The main airport in Melbourne is Tullamarine, and it is somewhat further from the city center -about 30 minutes by car. Melbourne also has a secondary airport in Avalon which serves both Melbourne and Geelong and Western Victoria. If you are flying from Melbourne and were just planning on using Melbourne airport parking but you think it is too expensive, Parkos has found car parking lots close to Melbourne Airport. This saves you a lot of time and, since they are cheaper, they allow you to save money. You can compare cheap airport parking and book and pay your spot online. Small regional airports, on the other hand, serve the most isolated areas within the country. Some are literally the size of a bus stop, a dusty airstrip for the famous Flying Doctor service. One of the first things that catches the attention of all visitors in Australia how strict the customs agents are. Before landing, passengers are warned of the important sanctions for those who try to enter illegal things in Australia. Australia does not allow you to bring any fruit or food to avoid spreading diseases, so watch out because you can’t even carry a single apple with you. Once at customs, you will be asked for three documents: your Passport, a valid visa, and the Incoming Passenger Card & Customs Clearance. This form will be given to you on the plane before arriving in Australia and it contains questions about your suitcase content and the money you carry in cash. If you don’t want to have your suitcase examinated, you only have to tell the truth and declare everything. Do not bring food to avoid problems, and if you happen to carry more than 10,000$ AUD in cash –which is unlikely, declare them as well.